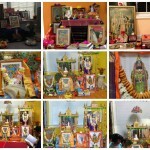 Categories: Rama, Rama, Rama Navami, Sita, Sri Swamiji's Kirtans, Srimad Ramayana. 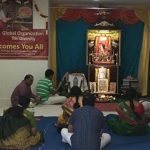 With the boundless grace of Sri Swamiji and infinite compassion of Sri Sita Lakshmana Hanumath Sametha Ramachandra Mahaprabhu, Virginia GOD satsang celebrated “Sri Rama Navami” from March 27-29 2015, with “Sri Sundara Kanda Parayanam” (Recital from Srimad Valmiki Ramayana) and rendition of Madhura Geetham, Ashtapathi and Sampradhaya bhajans. 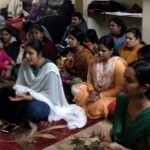 On Friday,March 27th 2015, satsang took place at the residence of Sri Ramanji and Smt.Lalithaji. Utsav commenced with Guru Kirtans followed by Sri Sundara Kanda Parayanam, Nama Ramayanam, Ashtapathi and concluded with Sri Sita Rama Dolothsav. 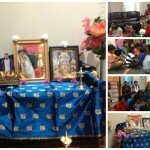 Saturday morning satsang was organized at the residence of Sri Balaji Smt.Vidhyaji. Being Sri Rama Navami day, devotees celebrated birth of Ramlala by doing Sri Rama Janana parayanam and resumed Sundara Kanda Parayanam. Following this, Azhwar Pasurams and Raghuveera Gadyam were recited. Satsang culminated with the rendition of Rama mangalam Stotram by Kum.Dhivya and chanting of Hanuman Chalisa by Gopakuteeram kids. 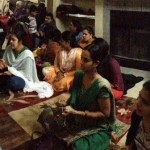 Satsang took place at the residence of Sri Annaswamy Natarajanji’s residence on Saturday evening. 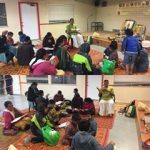 Devotees continued with Sundara Kanda Parayanam as Sri NatarajanJi soulfully expounded upon nectarine verses of Sundara Kanda and went on to illustrate how Ramayana remains a exquisite treasure of our rich culture as well as a pragmatic guidebook to lead a joyous and contented day to day life. Pravachan was thoroughly relished by one and all. Satsang concluded with Mahamantra kirtan and Arathi. 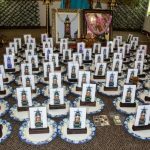 On Sunday, March 29th devotees gathered at the residence of Sri Muraliji and Smt.Malathiji for the final day of Sri Rama Navami celebrations. 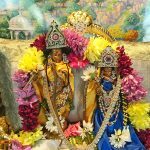 Devotees gathered around Sri Sita Lakshmana Hanumath Sametha Ramachandra Mahaprabhu who adored majestically upon beautifully decorated Ariyasana. Sundara Kanda Parayanam was culminated followed by rendering of Alwar pasurams and Madhurageetham. 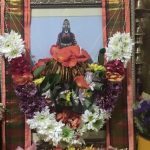 Sri Rama Pattabhishega Sarga was recited after which devotees showered fragrant flowers upon lotus feet of Pattabhi Rama in midst of cheering Namakirtan. Celebrations concluded with Anjaneya Utsav, Sri Sita Rama Dolothsav and Mahaprasad. Around 30 fortunate devotees participated in this 3 day Utsav, to be drenched in blissful grace of Sri Swamiji and Sri Sita Lakshmana Hanumath Sametha Ramachandra Mahaprabhu.